What are the documentation procedures as an importer in South Africa? What is the certification process to import to South Africa? Types of documents required in South Africa to import goods? Import documentation process in South Africa, in detail. Information provided here describes about documents required by each import in South Africa which need to be submitted with customs officials for the clearance process. This post explains about various documents that every importer to be submitted with the South Africa Customs Authority in order to obtain clearance of the consignment. What are the import document processes need to carried out with JOHANNESBURG customs. Required documents to import in EAST LONDON port. Customs documentation requirements to import at DURBAN port. Documents required to submit with Capo town customs for importation. Documentation procedures for import at Johannesburg customs. What are the documents need to be submitted to import at Nelspruit port customs. Which documents should I provide at Johannesburg customs port location for import. Documents need to move cargo out of customs at Durban port customs location. Import documentation in PRETORIA port customs. 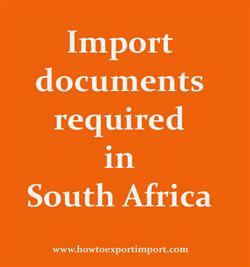 What are the documents required to import in PORT ELIZABETH.